Last time I shared one of the designs which comes from the Celtic Heather collection. 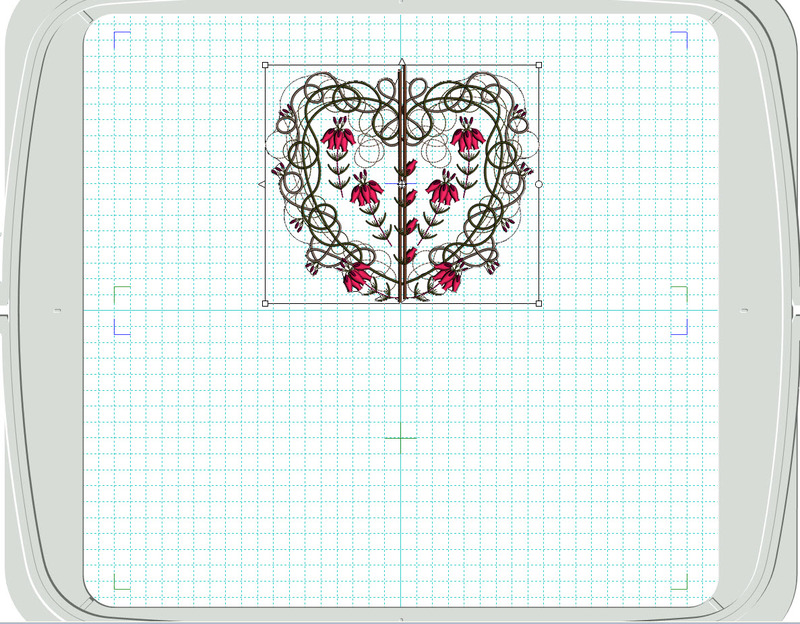 I was looking again at this lovely heart shaped design and opened it up in my software to see its possibilities. As it is St Patrick’s Day this week I was thinking about the shamrocks and all things Irish. I wondered if it could be edited to make a shamrock shape. Those of you have the Husqvarna software will be familiar with the encore feature and I am sure other software has it too. Now it may not look much like a shamrock or a four leaved clover but that was the inspiration behind this grouping. I set my hoop size at 360mm by 360mm as I wanted to embroider a pair of the designs in my extra large 360mm by 200mm hoop. Although I have the Majestic hoop I do prefer to use the smaller one and position the designs with my Outline alignment stitches. (OAS) There was a little overlap but the shape looked perfect and I could consider smaller designs to group around it. 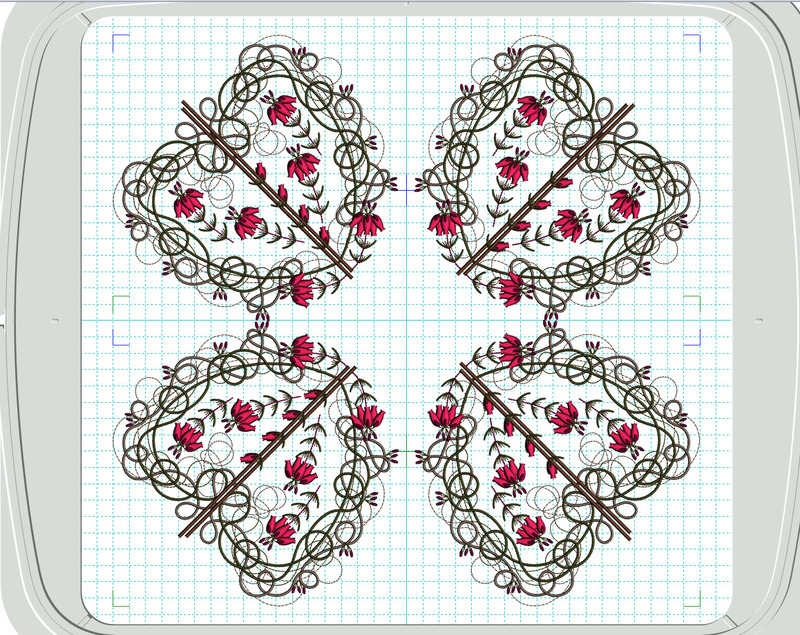 I had in mind a wall hanging for my Celtic Heather project. As I was developing this lovely Celtic embroidery I spent a great deal of time trying to incorporate the characteristics of heather and the environment in which is grows, which is why the collection has borders and panel type designs in it reflecting the woody stems of the heather plant. The heathland in the New Forest near where I live often has an early morning mist over it and in choosing my silk dupion fabric for my wall hanging, I selected a pale greyish green colour to imitate those weather conditions, as that would make the heather flowers stand out. Here you see the first pair of designs stitched out ready for the second pair. It is hard to see but I am lining up the Outline alignment stitches underneath on my second hooping of stabiliser, using the cross lines of running stitches that mark the centre of my fabric. Within the collection you will find many designs suitable for creating frames, panels borders and inserts. Next time I will show you how I frame this centre piece with more designs from the collection. The first set of designs were launched today and I hope to release the second set tomorrow. Don’t forget my sale which is running on many of my Celtic designs! 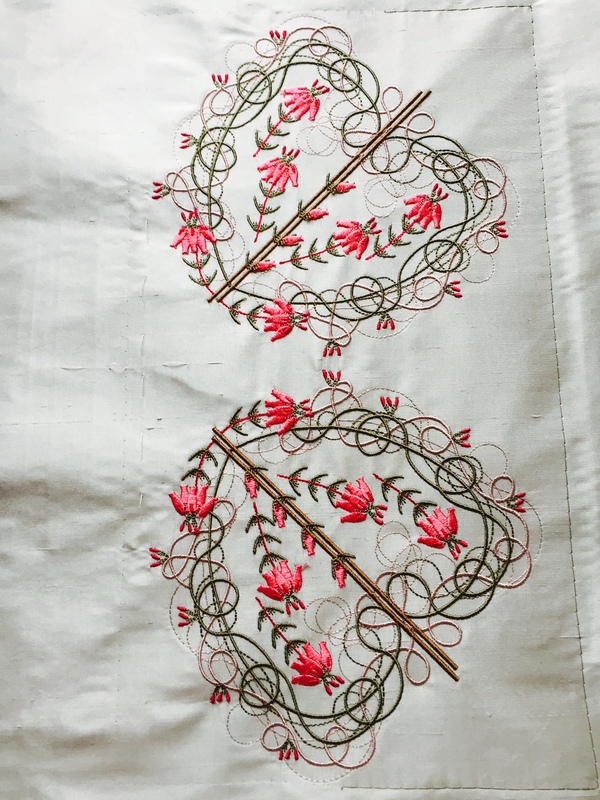 This entry was posted in Discussing machine embroidery, Embroidery projects and tagged Celtic Designs, St Patrick's Day. Bookmark the permalink.